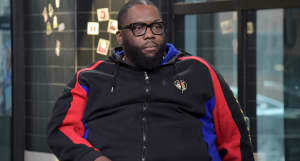 Killer Mike appeared in an NRA TV interview that was released on Thursday in which the rapper defended gun ownership in America. In a segment hosted by guns rights activist Colion Noir, the two spoke about Mike's stance on owning guns, and the Atlanta bred rapper explained that he is a gun owning citizen and expressed his support of ownership. We are a gun-owning family. We are a family where my sister farms. "We are a family where we'll fish, we'll hunt. But we are not a family that jumps on every single thing an ally of ours does because some stuff we just don't agree with," he said after explaining that he believed his kids shouldn't participate in last week's national school walk out which was organized to create conversation for gun reform. The Run The Jewels rapper is one of music's most vocal critics of American politics and not only raps about the political sphere, but has been a heavy activist. Mike sided with democratic presidential candidate Bernie Sanders in the 2016 election and often speaks on racial injustices.